While visiting Widow’s Hill, Kitty sees the Ghost of Jeremiah, who warns her of death should she stay. Back at Collinwood, Judith has regained her senses and seeks to withdraw her funding of Gregory by taking control of her finances. She charges Evan with this, and does so with impatient determination. Meanwhile, Quentin (in Petofi drag) convinces Evan who he really is, and they set about to trap Petofi and switch the bodies. Evan bluffs the disguised Petofi into attending and leading a black ritual, but at the last moment, they gas him into unconsciousness. It’s a riot, and it’s one more place where Astredo’s background as a comedian is evident. 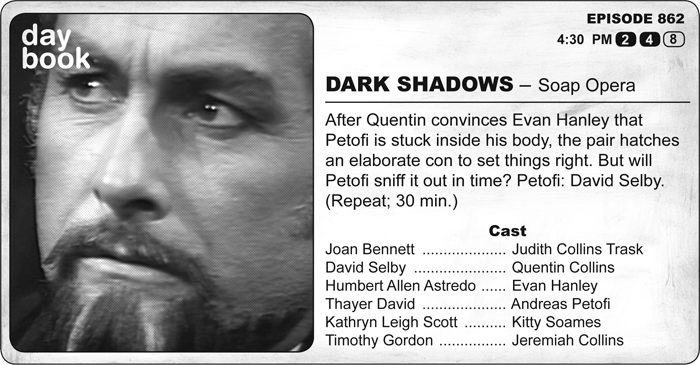 Spoiler alert -- the plan doesn’t work, and I think it’s because Evan had a bit too much fun setting Petofi up. The other half of the comical equation is David Selby. Here’s the dark secret of Quentin… he very rarely lives up to his potential as a character. It’s never more evident than when we see him possessed by Petofi. The wit is sharper. The desires are more ruthlessly pursued. By abandoning the desire to keep him likable, he becomes more likable than ever. The one area in which DARK SHADOWS characters suffer a deficit is in the realm of awareness. Quentin’s an interesting case, because he’s supposed to be one jump ahead of everyone, but as the series goes on, he winds up in Camp Ijustdontunderstand with everyone else. Villains fare a bit better. Right now, I feel like I’m seeing Quentin possessed by the character he could have been had they been allowed to take more risks. Why didn’t they? Story length. An aware character is a character who gets things done. Less aware characters do, too, but it takes longer. Now, think about the awareness level of the audience. They catch only a few episodes a week or they see them in between laundry loads. It kind of evens things out and allows the writers to stretch out the narrative. For one moment of the show, they had every reason to indulge themselves. It’s a delight to watch. Another highlight? Jeremiah appears for the last time. His appearance to Kitty certainly legitimizes the truth that she actually is the reincarnation of Josette.